While the release of Black Panther by Marvel is still causing global hysteria, Nigerians have fallen in love with charismatic Trinidad and Tobago star Winston Duke who played the role of M’baku, leader of the Jabari tribe. Winston who stole the show with an Igbo accent and attitude got Nigerians shocked when they discovered he wasn’t Nigerian. Now Nigerians are demanding for an accurately traced ancestry of Winston Duke. Although there were many reasons that made the Jabari tribesmen look and sound Igbo, like the name of the leader, M’baku which sounds like the Igbo name Mbaukwu which means great nation. He also says he has the spirit of Hanuman which sounds like the Igbo word Anumanu which means animal and when his warriors fight, they scream Abia! Which is a 95% homogeneous Igbo state in the south Eastern part of Nigeria, Winston maintains that his role wasn’t Igbo. He said in an interview that they only referenced Igbo. “I do more of a Nigerian Igbo influence. It’s not Igbo, but it’s influenced by Igbo because the rest of the cast is doing South African Xhosa. At that point, Nigerians knew that Winston must have had something to do with one Chinedu or Emeka if he is not one himself. Nigerians made up their mind that no matter what anyone says about Winston being from Trinidad and Tobago, even if they produce his family house, he will forever remain Okafor to us. 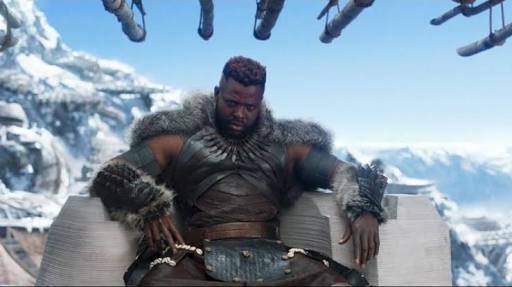 In his proper Igbo accent, look and character, M’baku stubbornly challenged T’Challa’s right to the throne. He had that stubborn attitude that most Igbos show when they disapprove of something and when he lost, he went back home and repayed the good of having his life spared by T’Challa. A strong part of Igbo culture that abhors betrayal. Winston might be from Trinidad and Tobago, but Nigerians have now accepted him as one of us, so he should be prepared to be greeted with, ‘How far?’, ‘kedu,’ ‘bawoni’ etc when we see him. The ‘Hanuman” is in no way a reference to the Ibos rather it is to the Hindus.